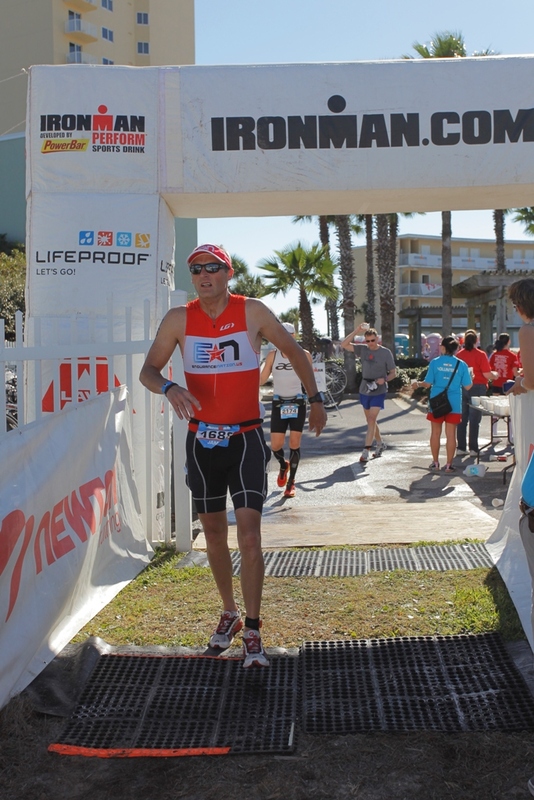 This was my first Ironman® and prior to the race, I had only raced in sprint distance races. When I registered for Florida in 2012, I knew right away I needed some way to train that would provide structured training plan for me to follow. I found EN via a google search and decided I would join when it opened to new member in Jan. 2013. I was a little overwhelmed at first simply because I had never trained with a plan and just didn’t know what to expect. 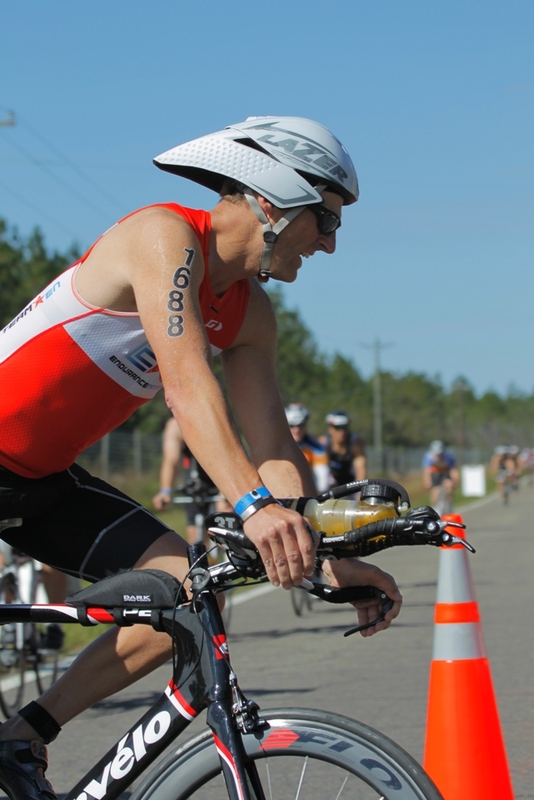 I submitted my season plan to Coach R. 5 sprint races and IMFL. Goal for Florida 12:30. 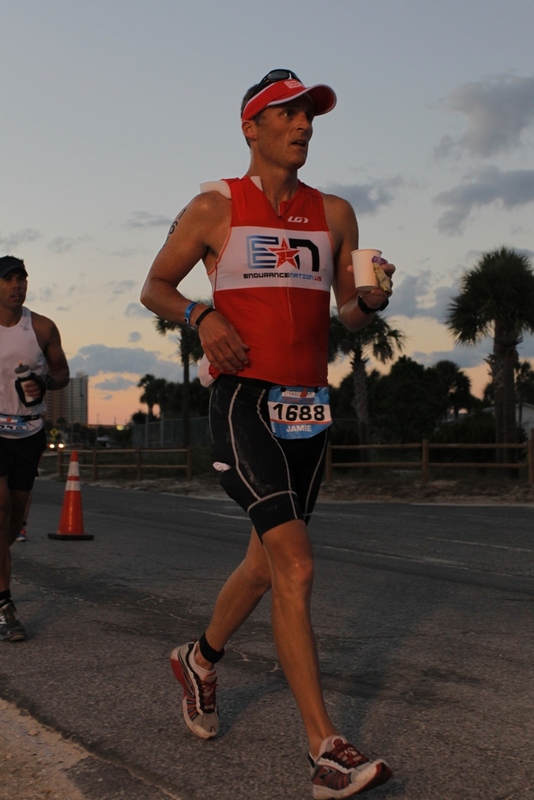 Listen to Coach Patrick’s chat with Jaime about his performance at Florida 2013 on the Endurance Nation Podcast, available in the player at the end of this post! I followed my pre race nutrition plan that was set forth through The Core Diet. I tried very hard to follow it as close as possible to ensure I was fueled and hydrated properly for race day. . Big dinner on Thursday, big breakfast on Friday, light lunch and a chicken breast and a cup of pasta for dinner on Friday. My only issue is all the applesauce!!! I just cannot seem to get it all down. If anyone has trick, please please share it with me. Woke a 3:30am for breakfast 3.75 cups of applesauce, 1 bottle perform, 1 banana, 4 oz whey protein. 1 powerbar (should have been 1.5 but nerves got the best of me) at 6:30am and sipped perform during that time. 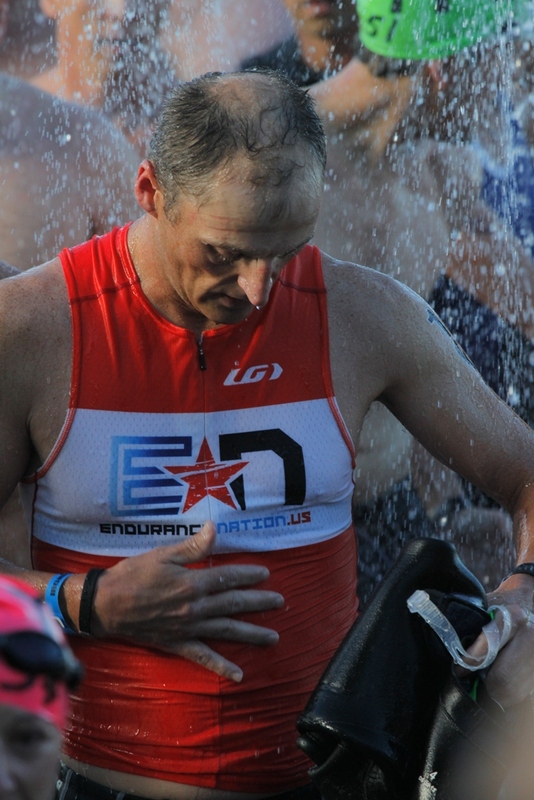 A gel & water 15min before race. Swimming is by far my weakest link in the sport of triathlon. I live in a rural area so I don’t have access to a pool nearby and therefore, my swim workouts suffered. I chose to use a pond of a family friend to complete my swim workouts. I struggled through most of my workouts for entire training period. I just never seem to get comfortable and relaxed during the swim. I did have a little nervousness but it wasn’t as bad as I expected it would be. I lined up almost as far right as I could and near the rear of the pack. I wanted to try and stay out of everyone’s way and stay calm as the swim began. As the swim got going, I was being pushed towards the buoys and into the main group. I stayed calm and just kept moving with the pack. Unbelievable, I didn’t feel the anxiety I expected I would and my heart rate stay in check for the entire swim. I didn’t really check my watch as I exited the first lap but just began to move down the beach. As Greg said, the crowd was forcing you back into the water, exactly the opposite of what the Coach P said in the 4 keys talk. I like, Greg, walked around and went down the beach to line back up with the buoy line and started back in. It wasn’t nearly as crowded but I still managed to have someone knock my goggles off a short distance into lap 2. Reset my goggles and continued on. As soon as I could stand up, I took off my top (2 piece Desoto) and continued to make my way in but was knocked down by a wave once as I was not so stable on 2 feet. Continued up the beach to the wet suit stripper but I chose not to sit down in the sand because the Desoto speedtube is fairly easy to remove. However, I still had them help me a bit. In hindsight, I’m not sure it wouldn’t have been to my advantage to continue moving up to T1 before removing my bottoms. I grabbed my bag fairly quickly and instead of going inside to put my stuff on, I chose to sit outside with many others that were doing the same. This seemed more logical to me and there was more space. Of course, I still had to go inside to drop my bag off and then come back out. Grabbed my bike and headed out to the mount line. I could have been quicker but I didn’t want to goof anything up by going too fast and end up doing something foolish. I didn’t exactly know what to expect for my bike time. My first RR ended with me being sick nutritional issue) and having to be picked up from my ride. 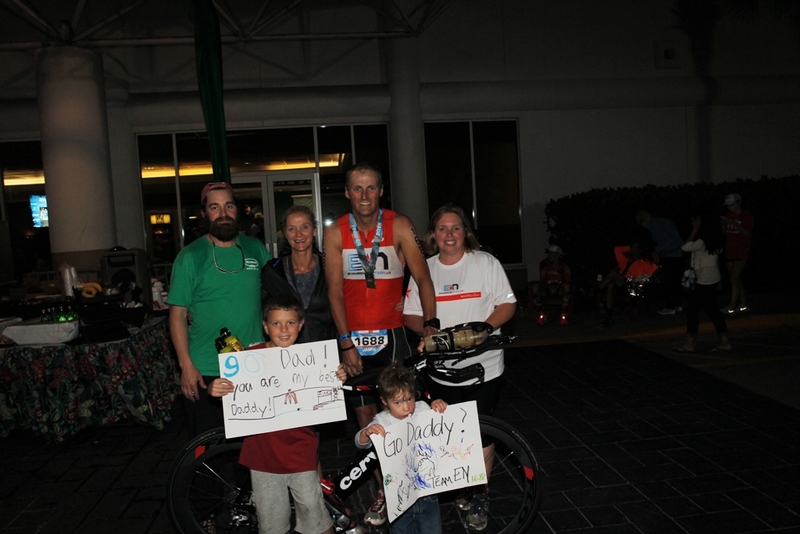 My second RR went better as I had my nutrition plan and planned better in the days prior. My second RR was 6hrs and right at 100 miles. My IF for that ride was about .63 because I was being conservative and wanted to finish it. Hopped on the bike, got settled in and that’s when I realized my Quarq power meter was not communicating with my 910. This was my fault and I created the problem the day before. In my haste to get the bike to check in, I changed the battery without checking it to make sure it was working with my 910. A total noob move and lesson learned. So without my power meter, I was riding a little blind but decided to use my heart rate and RPE to get me to special needs. I made the decision not to stop to fiddle with it until then. 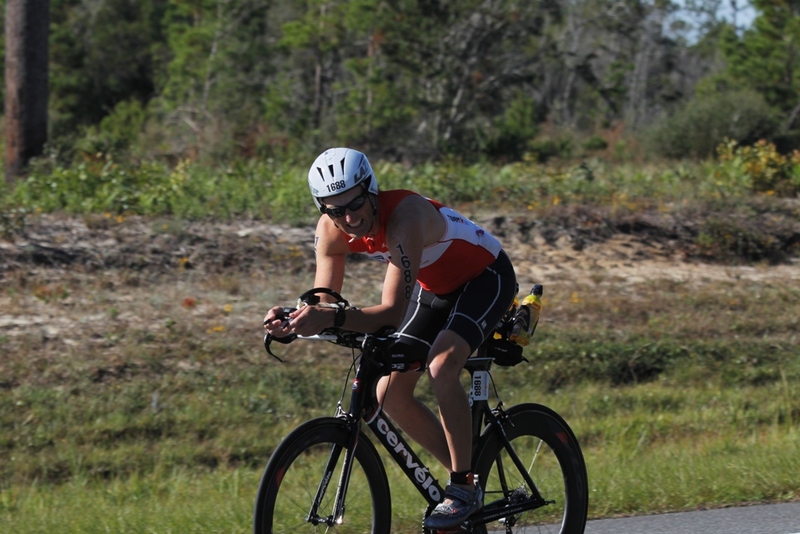 I kept my HR about 130bpm give or take and made my way to special needs. I hit special needs right around the 3hr mark. Got the rest of my nutrition and reinstalled the battery on my quarq. That corrected the problem I was having and I continued on my way. I still rode fairly conservative IF of .66 for the next 34 miles. Once I reached mile 90, I turned it up a bit and started passing lots of people (all those people that passed me in the beginning). Of course, the tail wind was helping but so was my conservative first 56 miles. I ended up with an IF of .69 for the last 56 miles. From the results, it looks like I passed 386 people on the bike and I don’t believe anyone passed me on the way back in. I said “on your left” quite a bit. My nutrition for the bike was 1.25 bottles of perform per hour, ½ powerbar and 2 clif bloks starting 10 min into bike, then another at set 35 min. 1 gel every 25 min apart (3 total). Then repeat the above until the end. I did fairly well for the first 2.5 to 3 hrs and then I think I got a little behind on the bottles and I couldn’t remember how many 20oz bottles I had taken. I just continued to drink so I wouldn’t come up too short. I could do the gels but began not to be able to chew the powerbars and get them down. This is something I have to work on in the future or else make some change to my nutrition plan to not use these. I’m not sure where I ended up on drink but I did pee 4 times while on the bike. Handed off my bike and quickly found my T2 bag, said a quick hi to John Withrow, and headed inside. Found a seat and quickly put on my socks, shoes, visor, and race belt. Grabbed my banana and headed out. Right away, I knew something wasn’t right. I tried to eat the banana as I exited T2 and just couldn’t do it. My stomach was in sort of a cramp or bloated. Not sure which, but it hurt and I didn’t feel well at all. I stuck to the execution plan though, my race pace plus 30”. Just as Coach P said, everyone would fly by me and they were. I kept telling myself that was ok and I would catch them later. I actually told one guy that when he made a comment that he was passing me. I was having trouble with keeping the perform down and it made my stomach hurt worse as did the gels also. I couldn’t swallow the saltstick tablets either. Once I made it to 5.5 miles I stopped and briefly talked to Coach P and he recommended I switch to coke and take the salt tablets that way for the next 3 aid stations. I didn’t know if it would help but it did and I was able to swallow them. Immediately I began to feel better. I sipped slowly on my gels with a little water but they seemed to make the stomach issues come back. So at each aid station I took a cup of perform, a cup of coke and a cup of ice. I added chicken broth once it was available. After 6 miles, I picked up the pace to my estimated race pace of 10:30 and tried to stay as close as I could to that, walking only the aid stations. I stayed fairly close to that through mile 18. At that point, I felt good and I continued to pick up my pace. From mile 18 to the finish, each mile was progressively faster. I passed 333 people on the run and I don’t think I was passed after mile 18. I finished up strong and crossed the line at 12:10:57. I actually didn’t know what my total time was because my watch was slightly off. I was elated though that I had actually beaten my goal my nearly 20 minutes! It was great seeing my teammates out on the course and being able to give and receive words of encouragement along the way. 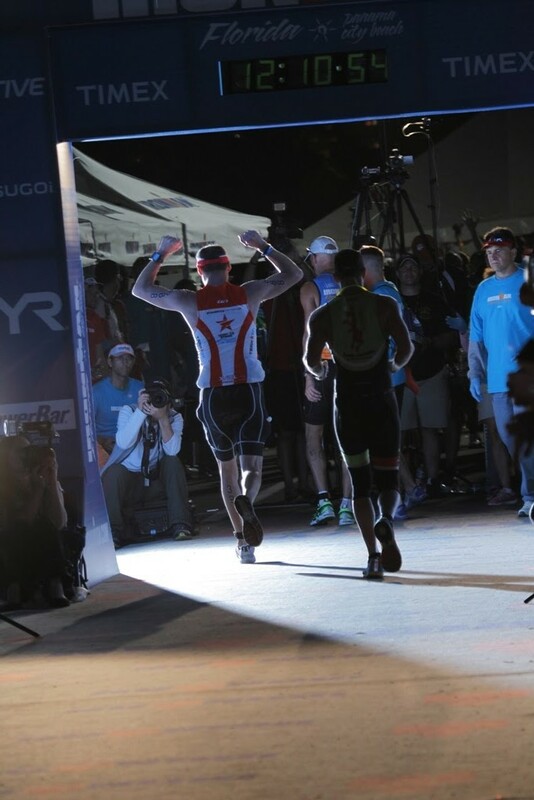 Without a doubt, Endurance Nation as a whole helped me to achieve and exceed my goal for this race. Work Works! *My wife Pam (on right) & kids (Tucker and Allie), my photo sherpa Russell, and my personal massage therapist…my aunt Tammie!